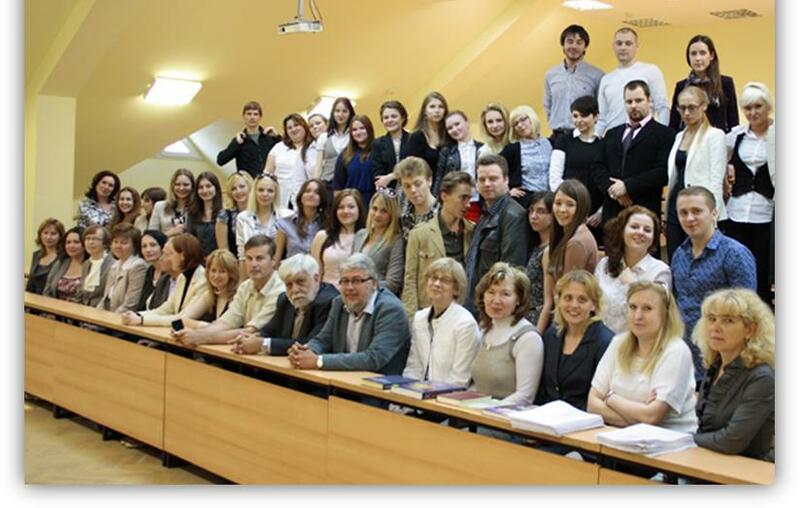 The Faculty of Legal and Forensic Psychology was established at the Moscow State University of Psychology and Education in 2004. 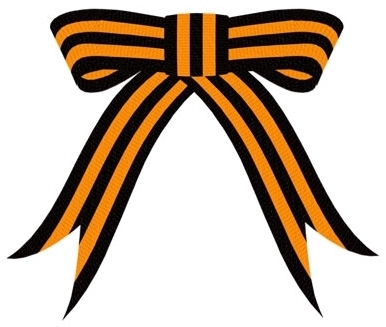 The basis of the Faculty is the agreement between the University and the Serbsky National Research Center for Social and Forensic Psychiatry of the Ministry of Health of the Russian Federation. 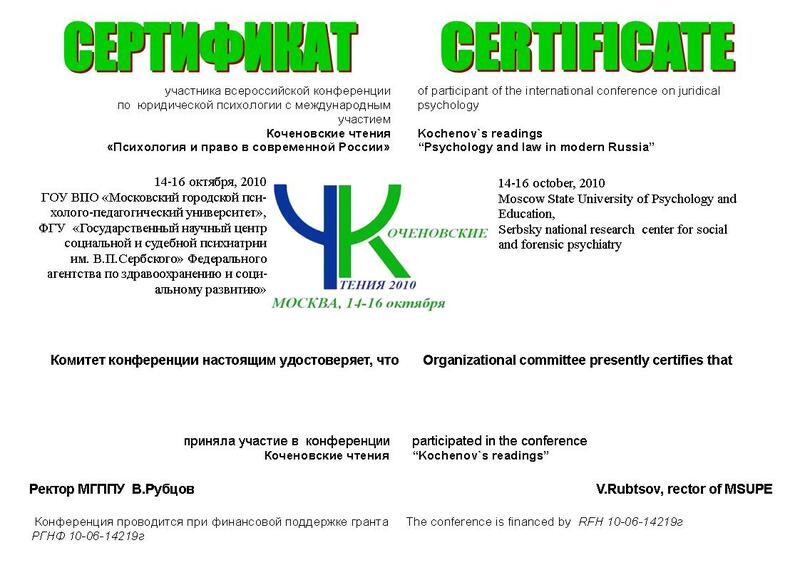 Apart from traditional branches of psychology in its interrelation with law – criminal, forensic, penitentiary psychology – special attention is paid to the psychological problems of children, adolescents and their families in the legal context, as well as to the issues of forensic clinical psychology. These features, along with the strong practical orientation, make up the unique character of the Faculty. Chair of Legal Psychology. Chairperson – Prof. E.G. Dozortseva, PhD. Chair of Clinical and Forensic Psychology. Chairperson – Prof. F.S. Safuanov, PhD. Chair of Criminal Psychology. Chairperson – Assist. Professor S.N. Enikolopov, PhD. Chair of Penitentiary Psychology. Chairperson – Assist. Professor M.G. Debolsky, PhD. Chair of Mediation in Social Sphere. Chairperson – C.A. Shamlikashvili, PhD. The aim of the program is education of high qualified psychologists working with children, adolescents and their families in legally relevant situations. Graduates possess knowledge of developmental psychology, child psychology, family psychology, legal and forensic psychology, legal regulation concerning children. They are trained in methods of research and practical technologies of prevention, psychological support, forensic expertise, rehabilitation and psychological counseling. Masters’ professional competencies are required in institutions of education, social welfare, justice, police, criminal investigation and in municipal organizations. The program is aimed at the professional training of specialists possessing broad scope of competencies, working in the interdisciplinary sphere of psychology, psychiatry, criminal and civil law. They should be able to carry out research and practical work in institutions of healthcare, law enforcement organizations and other agencies in the legal role of forensic expert, specialists or consultant. 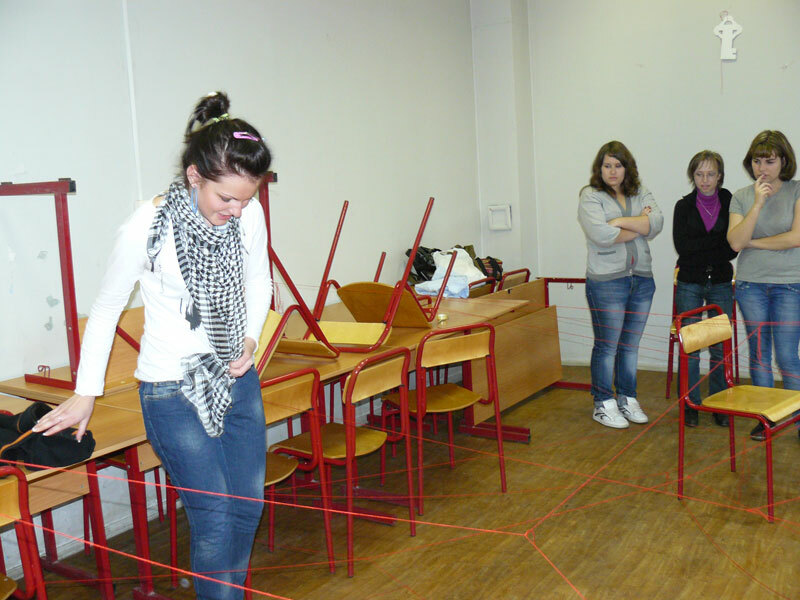 The aim of the program is training of high qualified mediators able to solve conflicts in families, schools (between representatives of the administration, teachers, students and parents), in the system of high education; in forensic practice; in the sphere of defense of consumers’ and other civil rights; in work with children and adolescents with deviant behaviour, juvenile offenders; in the sphere of social care and guardianship. Experienced teachers with scientific degrees, participating in the program educational process, are involved in practical and research activities in the respective spheres. Education plan includes fundamental disciplines (general psychology, clinical psychology, legal and forensic psychology, law), advanced study of developmental, social psychology, psychological counseling and psychotherapy, as well as of many other special subjects. 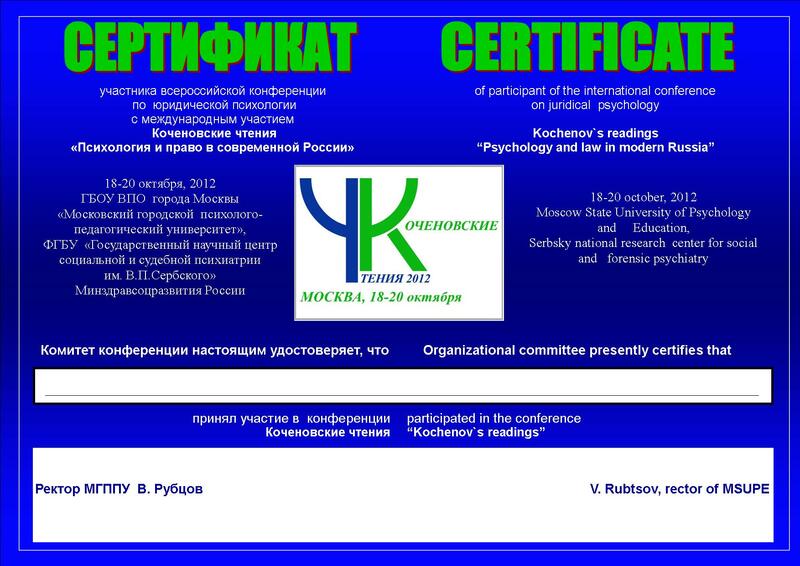 Mastering the education program presupposes practical training conducted in the Serbsky National Research Center for Social and Forensic Psychiatry, Social Rehabilitative Center “Krasnoselsky”, human rights advocating organization “Soprotivlenie”, departments of the Ministry of the Internal, penitentiary institutions and other organizations. The leading specialists in the field of legal, forensic, clinical, developmental psychology take part in the teaching at the Faculty. Psychological support for specialists working in the legal sphere.